The healthcare sector has been infiltrated by hundreds of fake pharmacies that are involved in shady deals and suspicious activities. Most of these sites dispense counterfeit drugs and low-quality medications that may be harmful to your health. 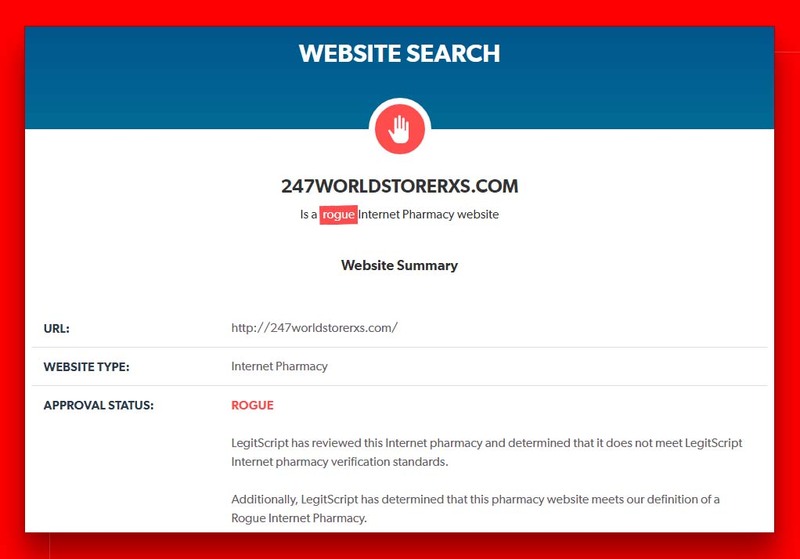 Today we review 247worldstorerxs.com, a typical rogue pharmacy involved in illegal activities. 1.10 Payments and Deliveries. Discount code. According to the domain information, the pharmacy was registered on January 28, 2018, and it is set to expire in 2019. The short lifespan of this website not only raises suspicions, but also puts a dent on the credibility of this pharmacy. Most scams do not last more than three years before closing shop. The site also claims to have been operational for over 7 years. 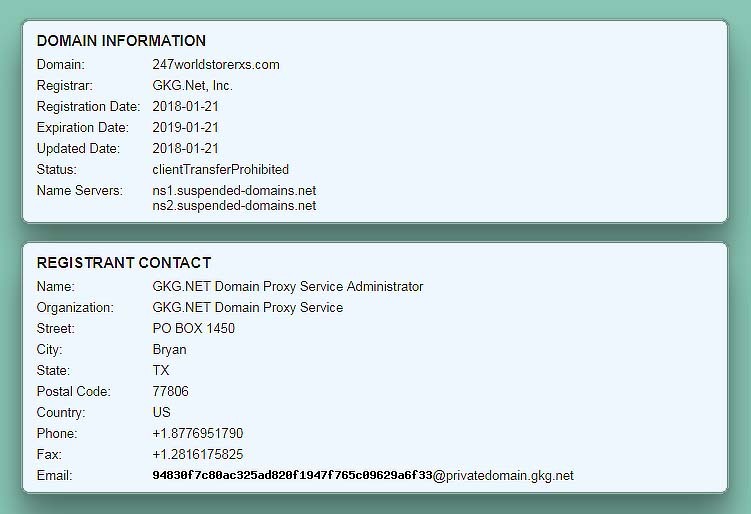 However, the registration date of this domain proves that these claims are false. 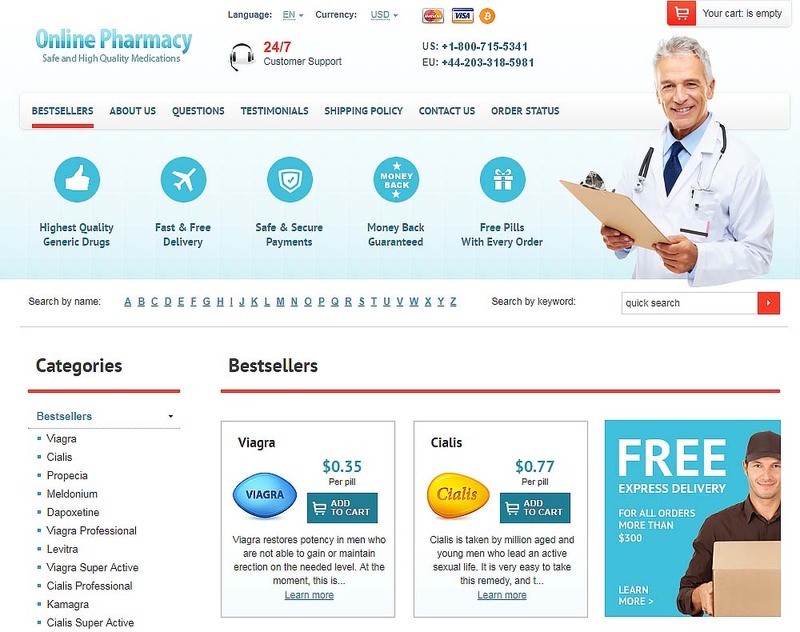 The web platform, including the layout, menus and other features suggest that this website belongs to a typical rogue pharmacy. Visitors are ambushed with a long list of men’s health drugs. We also discovered that the image used on the homepage does not belong to a real doctor, but a model. In addition to the poorly designed web platform, this pharmacy is related to dozens of mirror websites. Shockingly, most of these websites have a similar design and layout. The images are also the same as well as the products on sale. From these observations, we can conclude that this pharmacy belongs to an illegal affiliate program. 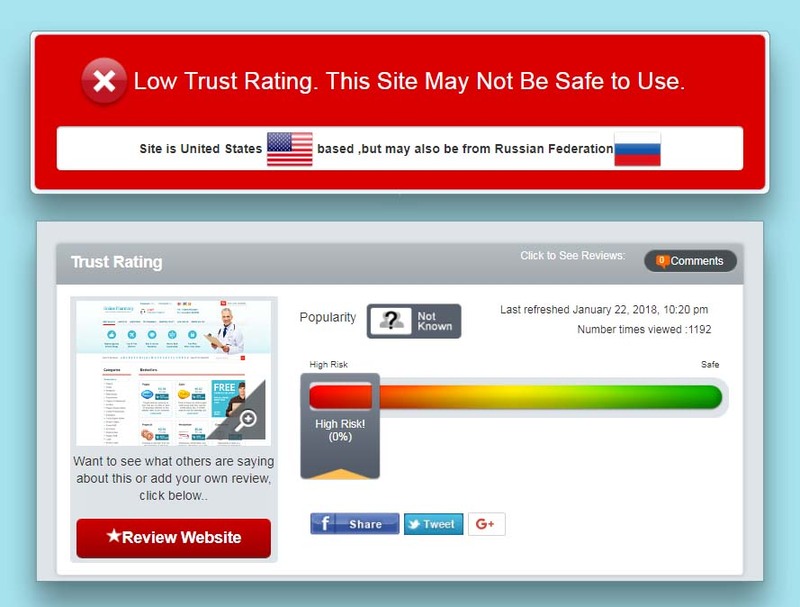 According to scamadviser.com, this pharmacy has the lowest possible trust rating of 0%. Essentially, it is not safe to transact on this website considering the fact that they do not have an SSL certificate. We also established that the owner is using a protection service to hide their details. We cannot tell whether the owner is located in the United States or in Russia. However, all indications suggest that this pharmacy is associated with Russia, which is a high-risk country renowned as a haven for scammers. The pharmacy does not have a registered business name. We can only guess that they are using the name “Online Pharmacy” as their business name. In addition, the exact location of this pharmacy remains unknown considering the fact that the owners are unwilling to reveal their physical address. Shockingly, the pharmacy does not have any certifications or legal approvals to support their legitimacy. It is not a member of CIPA, neither is it approved by any regulatory body. A search on legitscript.com reveals that the site has been flagged as rogue. With all these negative discoveries, clients are advised to stay away from this pharmacy. The chemist claims to offer a wide selection of drugs. However, most of the drugs that we came across are sexual health drugs. This category is often popular with rogue pharmacies. It therefore does not come as a surprise that the bestsellers on this platform are men’s health drugs. We established that all medications available for sale on this platform are generic drugs sourced from India and Pakistan. From the look of things, it is clear to see that the quality of these drugs is questionable. Just like any other rogue drugstore, you do not require a prescription to acquire drugs. You may order RX drugs without any restrictions. This clearly shows that the pharmacy does not care about your health, and they are only after your money. The price of drugs on this platform is too good to be true. We discovered that the pharmacy is offering drugs at prices 80% lower than average market rates. This raises questions about the source and quality of drugs. Payments and Deliveries. Discount code. The pharmacy accepts several payment options, including Visa, MasterCard, American Express, E-checks and Bitcoin. However, considering the fact that the platform does not have an SSL certificate, payments may not be secure. Shipping options include Regular airmail and courier services. 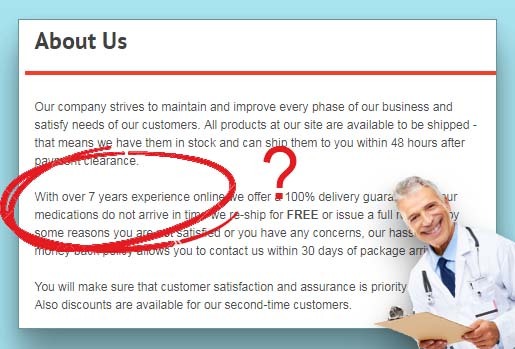 Delivery times depend on the destination of the package. Regular shipping takes 2-3 weeks while EMS takes 5-7 business days. 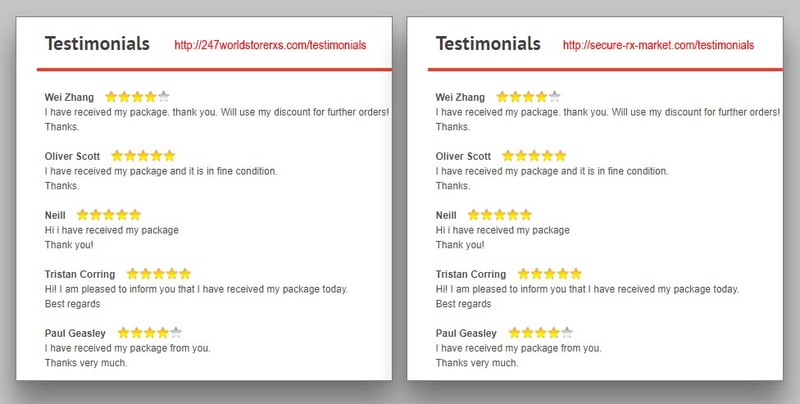 We discovered that all the testimonials on this site are fake. They do not have a date of posting or the location of the client. Furthermore, they appear copied from other phony websites. These fake testimonials show that this pharmacy is a scam. It is clear for everyone to see that this pharmacy is a scam. It does not have a business license either does it have any legal approvals. The fact that the owner is using an anonymous service just shows that they have something sinister to hide. We can only give it a 1.2 out 5 rating.